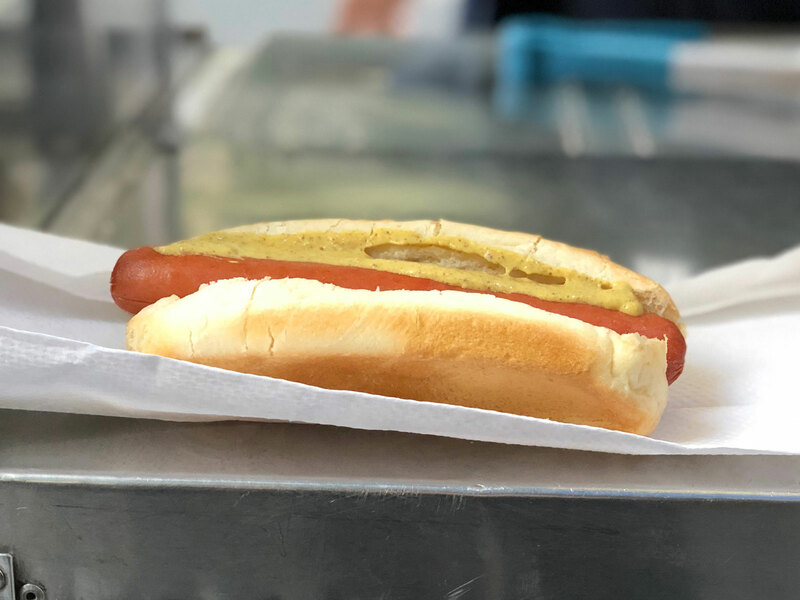 From the Home Depot to that cart on the street, we tasted the good, the bad, and the suspiciously free, joined by one of the nation's foremost hot dog scholars. Because of the gravity of this story, I enlisted an expert. I teamed up with meat monger and charcutier Fred Maurer of Hot Dog Boyfriend, the New York-based sausage pop-up. Prior to the pop up, Maurer worked at Dickson’s Farmstand Meats in Chelsea Market, and over the course of his four years there, he estimates he twisted nearly 200,000 wieners—by hand. That’s roughly 50,000 pounds of meat, which is a lot. He knows a thing or two about emulsified meats. One Monday afternoon, we set out to eat about a dozen hot dogs, tasting the meats exactly as they were presented to us unless there was a self-serve condiment buffet, or we were asked specifically what we wanted, in which case we said, “fully loaded.” Points were awarded to the hot dogs with the least stale buns, best cook on the dog, quality of toppings and topping-to-dog ratio. We are very happy to report that some of what we found was delightfully nostalgic and quite delicious; some was not, but we both made it out alive, which is something. 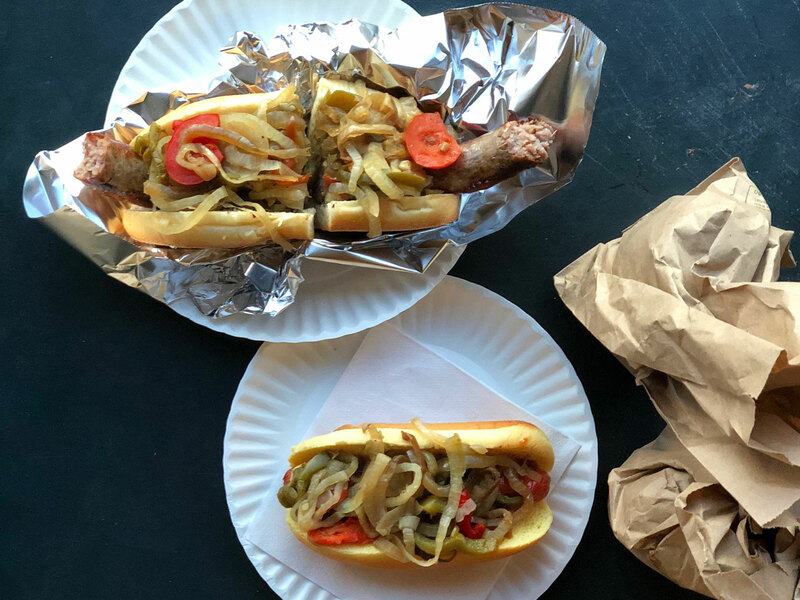 Below, our definitive ranking of not-fancy hot dogs and your guide to hot dog dynasty in New York, according to an actual hot dog expert, the Hot Dog Boyfriend himself. The Home Depot in Long Island City opened my eyes to a whole new world of Home Depot Hot Dog carts. This was not the Hot Dog Depot I was accustomed to, but a little slice of heaven called Rocco’s Italian Sausages, and the moment we walked in and spotted the sizzling sausage spirals on the grill beside piles of peppers and onions, we knew we were in for a treat. We got a loaded dog with mustard, relish, peppers, onions, and ketchup served on a Martin’s roll. Major points for Martin’s. The bar in Astoria doesn’t look like the type of place that would serve free hot dogs (an astonishing departure from Rudy’s Bar & Grill, but we’ll get there). It is polished and modern, with a full roster of craft beers. 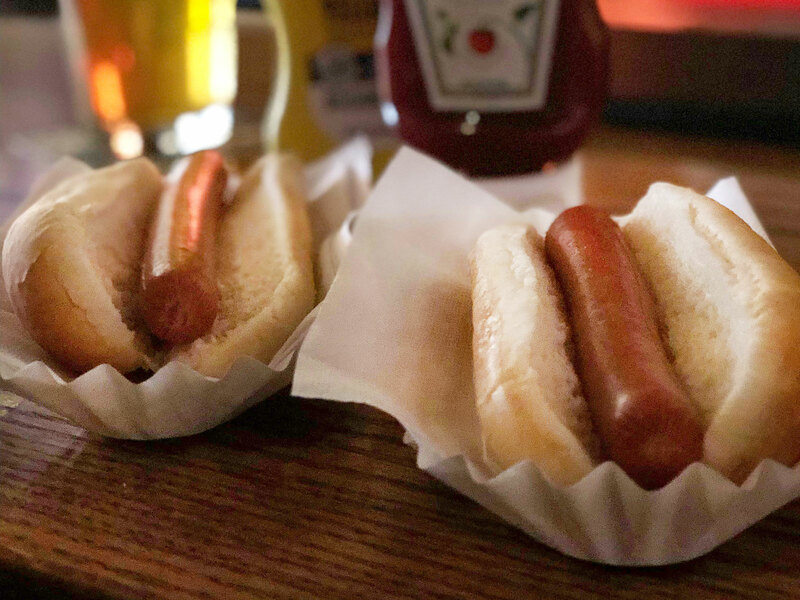 We ordered a couple of beers—served in cans—and were presented with two hot dogs, undressed, with ketchup and mustard bottles in tow. At Rudy’s in Midtown, you’re greeted by an oversized plaster pig clad in a red blazer, which is obviously delightful. 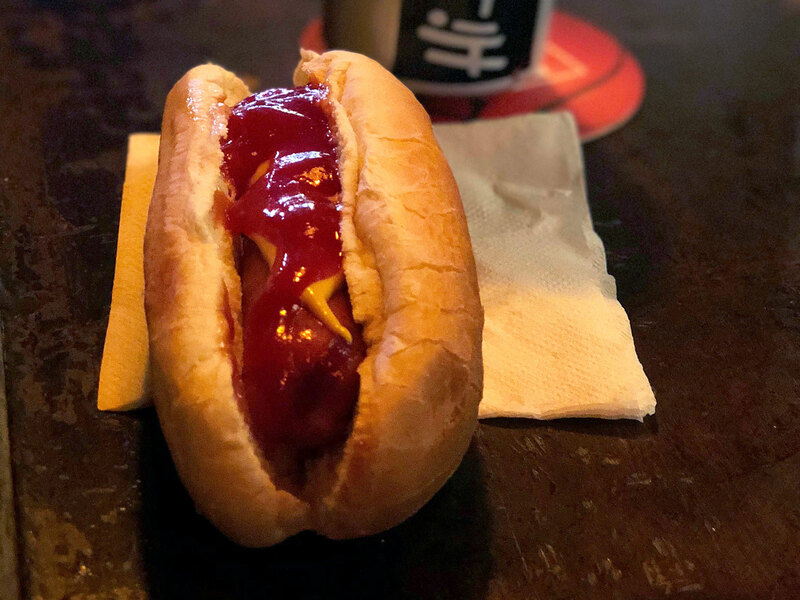 Rudy’s is indisputably a dive bar, and definitely not a place you’d necessarily choose to eat, but with every rum and coke or domestic beer you buy, you’re offered a free hot dog from the roller behind the bar. 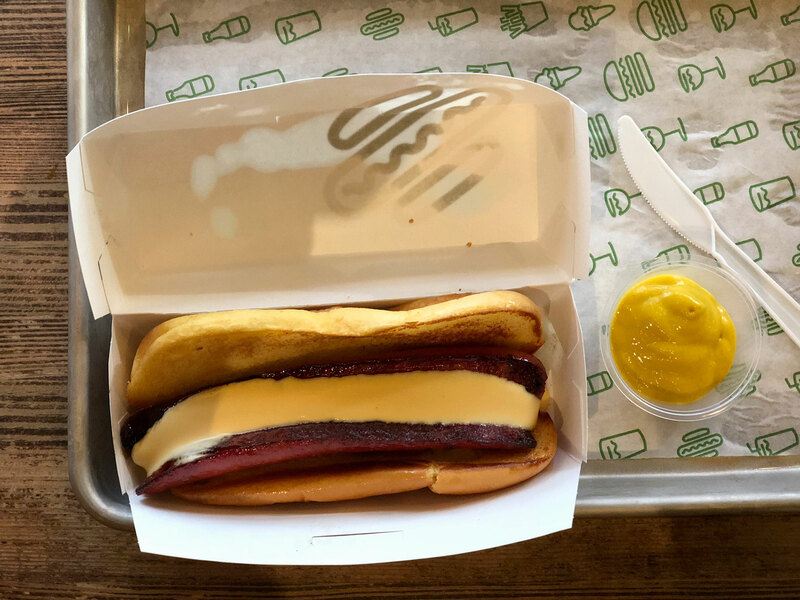 The dog: all-beef hot dog, cold, dried-out bun and served with ketchup and yellow mustard—we were not given an option. It was served on two thin napkins and placed on the bar top in front of us next to a couple cans of Narragansett Lager. 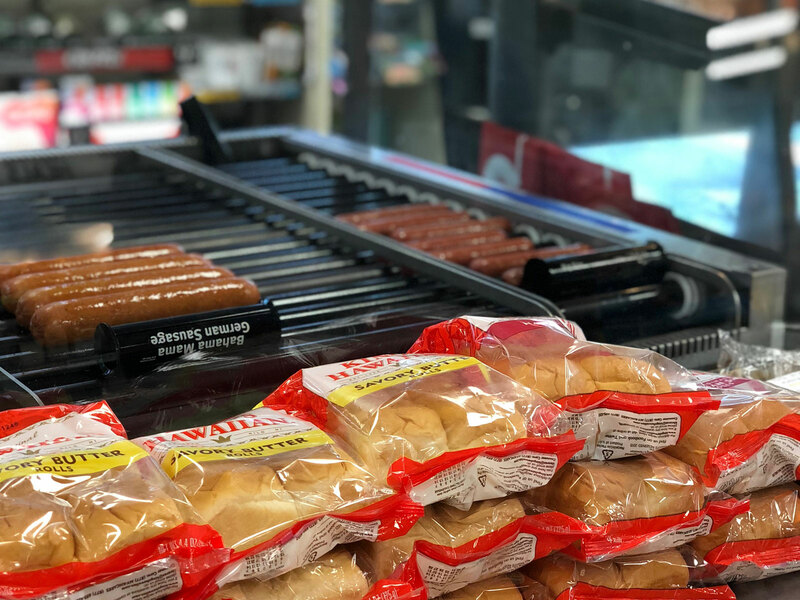 The tableau: rows of Big Bite hot dogs on the roller, illuminated by heat lamps warming both the dogs and the buffet of condiment packets, situated beside the Slurpee machines churning out flavors called Woo-Hoo Vanilla Blue and Full Throttle Frozen Blast. One step over the threshold, and we were home. We had three dogs: the classic Big Bite, the Bahama Mama German Sausage, and the Cheeseburger Big Bite, because I can never resist a cheeseburger, even on a hot dog tour, and here we had a cheeseburger that looked like a sausage. The Big Bite, which we topped with mustard and mayonnaise because why not, was just fine—no better or worse than any other we’d had thus far. “This is probably the best mustard we’ve tasted,” said Maurer. (It was just Heinz yellow mustard, but…points!). The Bahama Mama tipped the scales in 7-Eleven’s favor: we topped it with cheese sauce product and chili from the soft-serve-esque machine because again, why not. “The Bahama Mama was the top individual sausage of the day for me,” said Maurer. But unfortunately, what happened next brought the score down for America’s favorite convenience store. The Cheeseburger Big Bite, which was ground beef rolled into what resembled a sausage and filled with cheese, was probably the worst thing we’d ever tasted…in our lives. I took a second bite, just to be sure. Had we stopped at the first two, perhaps the ranking would be different, but I guess we’ll never know. If you’re strolling the streets of the city paralyzed by the anxiety of choosing a lunch place, the Halal Cart is usually the answer, but it’s unclear if people ever get the hot dogs. We did. We got the Chili Dog and the Hot Sausage, both with everything. The vendor cracked open a can of Hormel Chili (points!) and dumped it onto a small, all-beef hot dog perched upon its cold, stale bun and topped it with yellow mustard. “It’s silly to put beans on a hot dog,” said Maurer. 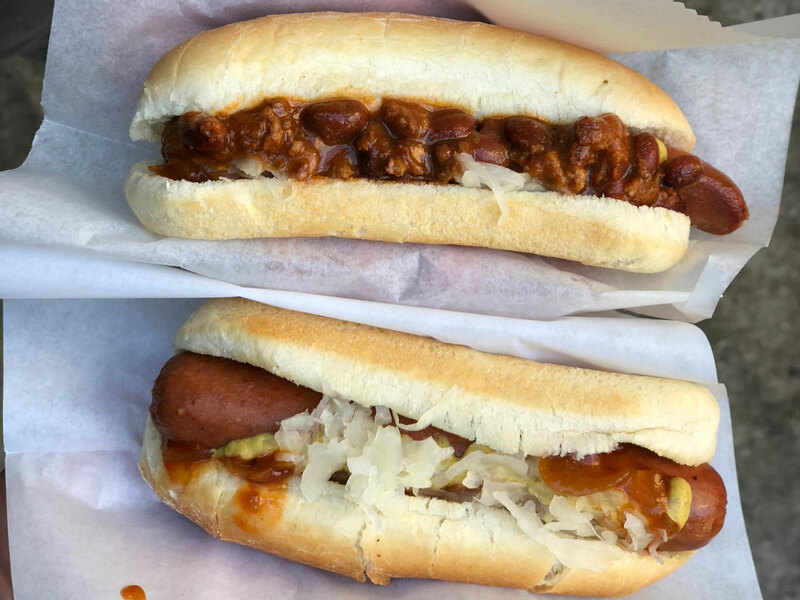 “I don’t know why there are beans in the chili, the mustard and the dog get lost them, but I like that it’s a little dog, and I appreciate that the chili was straight out of the can.” The Hot Sausage was a larger dog served on the same cold and stale bun, and topped with cooked sweet onions, kraut, and spicy mustard. It was busy, and a little too spicy. We have these things in New York informally called "dirty water dogs." You can infer the origin of the nickname, I’m sure. These are fine, but they’re no Double HDs (Home Depot Hot Dogs). The city streets are littered with these blue-and-yellow-umbrella-d carts boasting Sabrett dogs on the same stale, cold Rockland Bakery buns I’ve referenced at least five times, and they've cultivated somewhat of a reputation for making people sick. If you have a sensitive stomach and hunger strikes and the only thing in sight is that blue and yellow umbrella, I’d say you’re really rolling the dice. Otherwise, don’t listen when people tell you they’re gross. There are definitely grosser things?